• If the Madden cover contest is like the NCAA Tournament, does that make the vote-off for NCAA Football 13 the NIT? Oh, yeah, that's going on, too .... 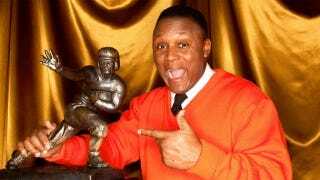 In the vote-off, Desmond Howard has advanced to face Herschel Walker, and Doug Flutie advanced to face Barry Sanders. I still say Sanders wins it all. The winner joins reigning Heisman winner Robert Griffin III on the game's box art. • Beginning next week, golf fans can win a custom design Xbox 360 featuring the stars on the box of Tiger Woods PGA Tour 13, Rickie Fowler and, well, Tiger Woods. They'll just have to look ridiculous doing it. Best Buy is staging the promotion, and you're supposed to go to a store on release day, March 27, dressed "like a Golf Pro," which probably means loud pants and a flat cap. Have play the game in full get-up, send that picture to TW13PGATour@hotmail.com or to Twitter under the hashtag #TW13betterwithkinect. More details and chances to win here. • Rob Gronkowski and Ahmad Bradshaw technically didn't "meet" in the Super Bowl, as both players are on offense for the New England Patriots and New York Giants. But they staged a rematch of sorts on Tuesday at a promotional event for Modern Warfare 3's "Collection 1" batch of DLC. This must have been after the tight end's brotastic escapades on Spring Break in Texas. You can see he's still got the Gronk boot on, too. Bradshaw again prevailed over Gronkowski with a match score of 3 to 2. • Apparently the St. Louis Cardinals' David Freese and San Francisco Giants' Buster Posey both love Wrigley Field. Both players chose the Cubs' home as their favorite ballpark other than their own, in Q&A videos MLB 12 The Show released earlier this week. That's Freese's vid at right, you may watch Posey's here. An avid golfer, he played at Augusta National last year, he says.